If you have a Kamado grill, a charcoal smoker or even an offset smoker and you’re looking for a simple way to turn it into a true ‘set it and forget it’ smoker then an automatic temperature controller could be the accessory for you. We’re going to go through everything you need to know about controlling the temperature on your smoker. We’ll go over some reviews, some tips and tricks and run down the best automatic BBQ temperature controller for the money. For years there has been one dominant name in automatic temperature controllers – BBQ Guru. They cover all the price ranges with controllers that comfortably maintain consistent temperatures for hours. But now other companies have joined the market and brought along some genuine competition. You now have WiFi controllers, variable speed fans, social integration and more. We’ll take you through everything you need to know so you can make a well informed and concise choice as to which automatic temperature controller will best suit you and your smoker. 1.5 Which one should you buy? Most smoker temperature controllers work in a very similar fashion. A fan is placed over one of the vents in your kamado grill or standard charcoal smoker. This fan is connected to a small temperature control unit. The temperature control unit is connected to one or more thermometers that measure the temperature of the meat and the smoker. The control unit is usually a PID controller that will use the data from the thermometers and the fan to maintain a very even temperature in the smoker. The reason this affects the temperature is because the fans alter the level of oxygen in the fire. The more air the fan can pull into the smoker, the higher the temperature. The aim of the controllers is to smooth out any fluctuations in the temperatures whilst cooking. This is useful because it creates a complete ‘set it and forget it’ smoker so you can go off and do whatever else needs to be done. You can even go to sleep and leave these on overnight. A consistent temperature not only gives you an easier smoker to handle but it also gives you better results. 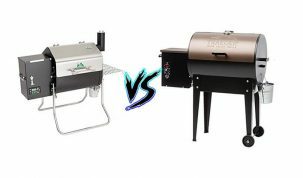 Here’s a nice graphical comparison from BBQ Guru. 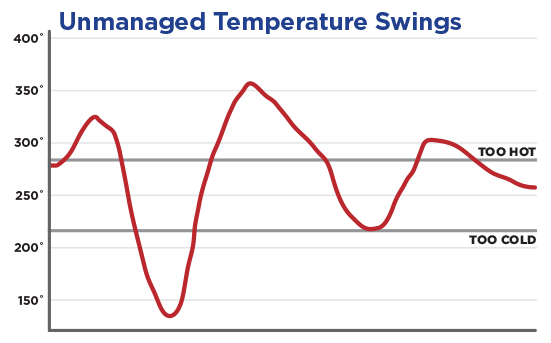 All the automatic temperature controllers work in the same way and produce very similar results. Usually the fans are simple on or off fans. This has worked fine in creating a fairly accurate system that can maintain temperatures close to your desired temperature. But now some companies, specifically Flame Boss, have incorporated variable speed fans into their design. A variable speed fan is simply a standard fan that can have the speed it spin altered by the amount of current place through it. This allows a lot more precise control over the temperatures. Whether this feature is needed or is just a gimmick will be explored later when we compare the Flame Boss to the BBQGuru. Smoker temperature controllers aren’t going to be needed for every smoker. For example, most pellet smokers have similar controllers built into them. 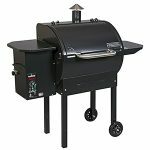 The two major types of smokers that benefit from additional temperature controllers are Kamado Grills and charcoal smokers, like the Weber Smokey Mountain. The controllers generally come in two types as well. “Kamado” or “Universal”. 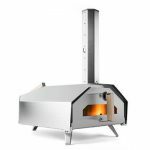 These can fit a wide range of Kamado grills or charcoal smokers, but when you’re buying check the manufacturers website to make sure that the controller will fit your smoker. 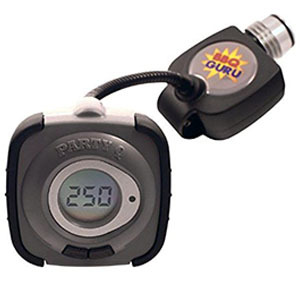 The PartyQ is the cheapest temperature controller that BBQ Guru make. It has a single temperature probe and a simple two-button control system with a single number display. This is about as simple as you can get, the display shows the temperature that the probe is reading and that’s it. Despite the simplicity it does the job nicely. It keeps temperatures fairly steady and can easily turn a Big Green Egg or a Kamado Joe into a fool proof overnight smoker. It has adapters for pretty much all the big named smokers you can think of so it shouldn’t be a problem finding the fit for your smoker. The simple controls mean that you do have a lack of options and barely any feedback to give you an insight to what is going on with the meat. There isn’t a meat probe included which you almost certainly need if you’re going to take smoking seriously. We’d suggest grabbing a standard digital meat thermometer setup as well so you have another temperature reading. We recently did a rundown of the best smoker thermometers. Also, if you find yourself having to open the lid of your smoker, the fan will go crazy and take some time to recover. The PartyQ runs off of batteries which we quite like, they last a long time and means that the unit is completely portable. It would have been nice if there was an option to run it off of an outlet as well but at this price you can’t expect everything. 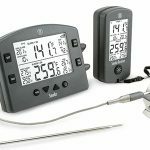 If you’re looking for a simple, quality BBQ temperature controller then the BBQ Guru PartyQ is one of the best you can buy. Latest price for PartyQ for Big Green Egg or Ceramic Cookers. 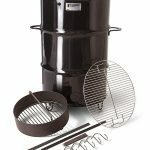 Latest price for PartyQ Weber Smokey Mountain Cooker and other standard charcoal smokers. Pitmaster are one of the smaller companies to try their hand at the automatic temperature controller market. The IQ110 was their first effort and for a low budget controller it’s a pretty good attempt. It is very similar to the PartyQ in that it uses a fan to regulate the air flow and control the heat. It has a single clip-on probe and simple controls. What the IQ110 is lacking is any form of screen. It uses completely analogue controls in the form of a small dial. This means there is no feedback from the thermometer. So, if you use this model we would recommend possibly using a digital meat thermometer as well. It worked well for the single cook we did with it. The temperatures didn’t fluctuate much at all and it was relatively painless to maintain. The set-up was pretty simple, although we found the PartyQ’s set up to be just a little easier. 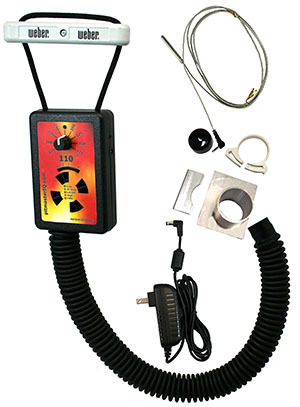 The IQ110 runs off of a mains outlet or a 12VDC cigarette lighter. We think that this is superior to the PartyQ’s battery system as this still maintains portability but also has the consistency of having mains power. We also found the build and structure to be a little clunky and a bit big. This isn’t a huge problem but when you’re comparing it to the PartyQ it feels a bit cheaper because of it. A lot of these problems are fixed in the IQ120, which includes a display screen, food probe, alarms and a few other nifty little features. But the IQ120 is priced similarly to the DigiQ from BBQ Guru, which is a mid-range item. The IQ110 is still a very good controller though, the temperatures were good and it was easy to set up. It’s also the cheapest automatic temperature controller on the list. There are definitely a lot of positives to the IQ110 but be aware of the slight down sides. 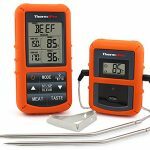 Overall, if you’re on a stricter budget then this is one of the best automatic BBQ temperature controllers you can buy. 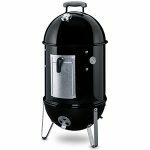 Latest price for IQ110 for Weber Smokey Mountain, Weber Kettle and many other standard charcoal smokers. 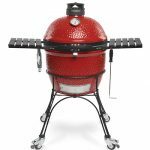 Latest price for IQ110 for Big Green Egg Small, Char-Griller Akorn, Kamado Joe Jr. and many other small Kamado Smokers. Check out our full review of the DigiQ DX2 for more information. 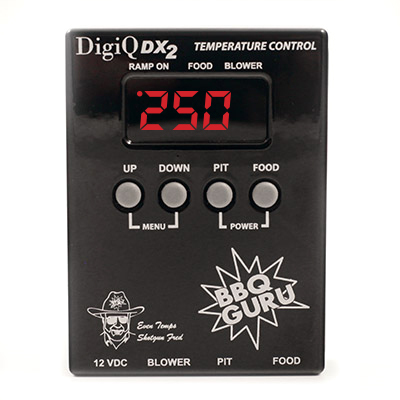 The DigiQ DX2 from BBQ Guru is a mid-ranged smoker temperature controller that comes with two probes, one for the food and one for the grill itself. Straight away this is a great reason to buy the DigiQ over any of the low budget options. It runs on a 12VDC supply and has an adjustable fan controller. The fact that it doesn’t use batteries like the PartyQ does is a great step in the right direction. We greatly prefer not having to use batteries. The adjustable fan is good. It’s a Pit Viper fan that provides a nice consistent flow of air and is well built. It has a small plate that you move before your cook that is used to control how much air it can blow into the cooker. This is a fairly nice feature but feels a bit archaic, especially when you compare it to the Flame Boss fans. Having said, this it does work well and the whole system produced some incredibly precise temperatures. There are some nice bonuses with the DigiQ. You get a mounting stand and a small storage bag that are both good quality and surprisingly useful. It automatically shuts down when the lid is opened, which is a great feature, and has alarms for when your food is done. It has four buttons to help you make your way through the controls. These are fairly simple to use but as the display only shows one thing at once we did find ourselves having to scroll through a lot of options to get what we wanted. Again, this isn’t a huge problem but when we compare it to some of the higher-end models it’s a big step down. It also doesn’t have WiFi so if you want to see the temperatures or change the settings you have to physically go to your smoker and check. Overall, this is a very good temperature controller. It has a very good build quality, it keeps temperatures very stable and is easy to use. At this price, you can’t ask for much more. The DigiQ is our best automatic BBQ temperature controller if you’re looking for a mid-range option. We were close to not including the Flame Boss 100 on the mid-range list because it is so close to the high-end pricing category. This is the reason it isn’t our first choice because the price is just a bit too much. But we do think it is the better option of this and the DigiQ DX2. The Flame Boss is generally around $50 more than the DigiQ, which is a lot. It does have a ton of great features though. It has the clearest display of any temperature controllers we tested. The screen can show food temperature, pit temperature, the chosen temperature, and the fan speed. It has an automatic learning PID controller. We’re not sure how the automatic learning part of it works, and still couldn’t figure out if it’s a gimmick or not, but that’s what Flame Boss claim. 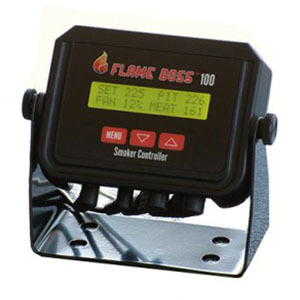 We love the Flame Boss controller, both this and the 300. The only difference being this one doesn’t have WiFi or any of the wireless features. Despite that this is still a fantastic controller. It held the temperature better than anything else we tried and has all the alarms you need to safely cook. The best thing about it, though, is how simple it is to use. You connect the wires, clip on the fan and then plug in the power. After you’ve set your temperature it does all the rest. The variable speed fan works like a charm and we think that this is the reason the temperatures were so constant for us. The settings and display are easy to use and change. There is very little toggling through menus. The build quality is also very good, being mostly built from a strong plastic. The fan is one of the best we’ve seen. It feels very durable and even looks really good. Overall, the Flame Boss 100 (and 300 which we’ll get onto later) is the best automatic BBQ temperature controller that you can buy if you’re looking for a mid-ranged product. 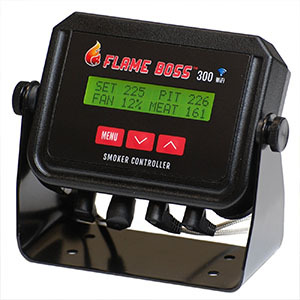 Check out our full review of the Flame Boss 300 for more information. Like the Flame Boss 100, the 300 version has all the bells and whistles that the 100 has but it has one big difference. It has WiFi. You still get the variable fan speed which gives very accurate control over the temperature. It has the same PID controller. There is the same LCD screen, stand and buttons. It also has all the smaller features that the 100 includes, such as the alarms and the open lid detector. A nice addition to the 300 is it has the ability to include up to four probes at once. This requires you buy an additional probe and a y-cable but we think the ability to cook with and monitor four temperatures at once is a brilliant feature. But not the best. The best feature the 300 has is WiFi. WiFi allows you to connect your computer, smart phone or tablet to the controller wirelessly. You can even connect to Amazon Alexa and Google Home devices. When online you can access the online dashboard that gives you a huge range of data to monitor and even the ability to control your temperature controller. You can set the meat alarm to automatically turn down the temperature when the meat is the desired temperature and even get it to send you a text message to let you know. The interface is clean and clear and you’ll find yourself showing everyone your new gadget. 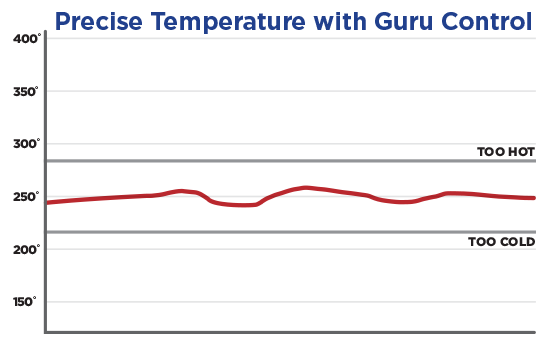 There are graphs and real time temperatures that make cooking far too easy! Connecting to the WiFi is a doddle. All you need is an internet browser and you’re good to go. Check out our full CyberQ Cloud review for more information. 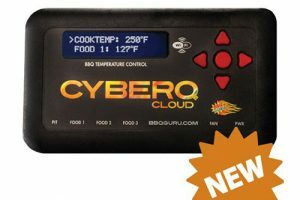 The BBQ Guru CyberQ has very recently been updated and we’re loving everything about the update. The new CyberQ Cloud takes everything that the old CyberQ did and has given it a refreshing makeover to give the Flame Boss some real competition. It retains the four probe set up from the previous CyberQ model and uses a Pit Viper medium fan, which, if it had variable speeds, would be the best fan available. You get quality, 6 ft probe wires so it will fit absolutely any smoker. The interface and screen are now much better. You can easily see the screen and the five buttons make for very simple navigation. 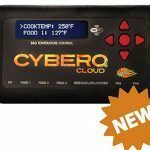 The CyberQ Cloud also uses the old CyberQ’s “full-time adaptive control algorithm” that learns about your smoker over time and adapts how it works to make full use of it. Like the Flame Boss’s similar feature, we’re not completely convinced on this one but it’s got it. Where the new CyberQ really shines in is the “Cloud”. There have been huge improvements. Now connecting is much easier, rather than having to create a make-shift connection between the controller and your phone, you simple connect like the Flame Boss. But where the CyberQ Cloud outshines the Flame Boss is in the options you have when you’re connected. You get all the real-time, graphical and text message features that you do with the Flame Boss but you also get the ability to fully share everything you do. You can upload pictures, comment on other cooks and share to Facebook etc. The CyberQ even lets you use commands with Amazon Alexa to control your smoker with nothing but your voice! If these features mean nothing to you then don’t worry as the actual temperature control is very nearly as good as the Flame Boss. We got incredibly steady temperatures with very little effort. We think the lack of a variable fan is the reason we prefer the Flame Boss but they are so very similar you’ll probably never notice a difference. 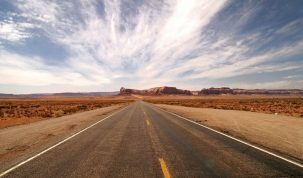 Now that both parties are back on the same playing ground with the new CyberQ Cloud we think the difference is very small. You’re going to be getting a brilliant temperature controller either way that will make your smoking so much easier that you’ll wonder how you ever lived without it. At the end of the day, it really depends on what you want from your automatic temperature controller as to which one we would recommend. If we had to choose one it would be the Flame Boss 300 because of the variable speed fan. We think it gives that extra level of precision and worry-free cooking that we can’t ignore. 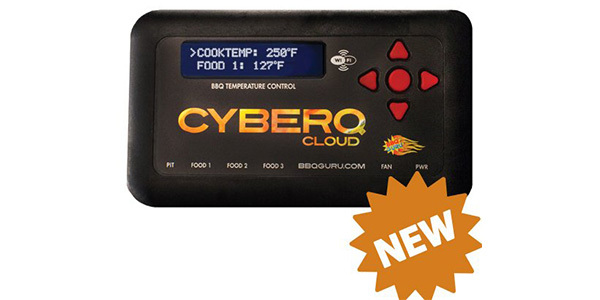 Although, the BBQ Guru CyberQ Cloud wins on compatibility as it has a huge backlog of adaptors for almost every smoker on the market. If you’re using a smaller brand smoker or even your own UDS then the chances are that the CyberQ Cloud is going to work with it. But Flame Boss’s universal adapter is said to work on a lot of other models so this is also closer matched than first though. Installing most of the temperature controllers are actually pretty simple. 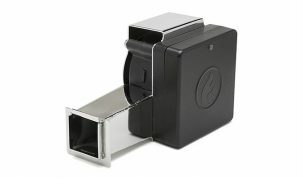 They’ll all have some kind of adaptor that attaches to the bottom vent of your smoker. Then the fan or the pipe will attach to the vent and to the controller itself. After you’ve added some power and attached your probes you’ll be ready to go. In most cases it’s important to close off all other vents so that the only airflow is caused by the fan, but usually leaving the top one open very slightly. It’s easier to heat up your smoker than it is to cool it down. 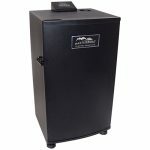 Even though these temperature controllers do a lot of the heavy lifting for you when you start your smoker you don’t want too much charcoal or too much initial heat. Slowly build the fire up and then let your controller take over. If you’re losing heat easily then there might be some heat leakage. In this case it’s possible that your smoker has some small holes and the temperature controller isn’t able to do its job properly. You’ll need a gasket kit to fix the problem and ensure maximum accuracy again. Even though you might be able to leave it cooking all night and day you have to make sure you have enough charcoal in the smoker. This may seem obvious but we’ve heard of a few times where people have left their smoker all day only to come back to it and it had completely burnt out hours ago. This is very distressing, don’t let it happen! A lot of the better models of smoker temperature controller have alarms for if the temperature gets too low so this shouldn’t be a problem if you pick up a good one. Make your life even easier by choosing one of the best meats to smoke. This is our guide to help you pick the best meat for smoking. Let us know in the comments or connect with us on Facebook if you have any questions or think we’ve missed something.